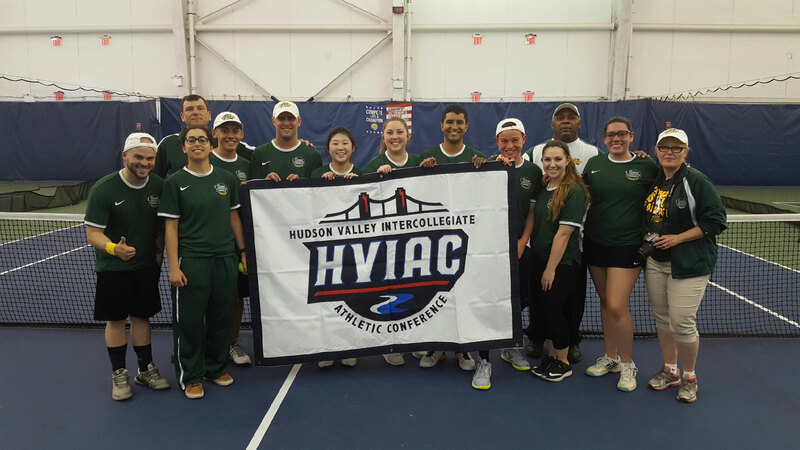 Hyde Park, NY–Playing on the same tennis courts where the U.S. Open tournament is held, The Culinary Institute of America defended its Hudson Valley Intercollegiate Athletic Conference championship on April 30. In an exciting match at the USTA Billie Jean King National Tennis Center in Flushing, Queens, the Steels won the final four matches in a come-from-behind 5-4 win over Berkeley College to take the conference championship for the second straight season. Last year, the CIA won the final three matches to beat the same Berkeley team by the same 5-4 score. The Steels finished the season 6-1, with a co-ed team competing against mostly men-only teams. In fact, the deciding match was won by CIA sophomore Gabriela Berrios (Cidra, Puerto Rico). In addition to their exceptional team showing, several individuals were honored by the HVIAC as standouts during the season. Freshman Justin Rife (Cape May, NJ) was named the league’s Rookie of the Year, with a combined 5-0 record in singles and doubles. Three Steels made the eight-member All-Conference Team: sophomore James Bouquet IV (Bay Saint Louis, MS) went undefeated in seven matches this season, sophomore Daniel Juarez (San Antonio, TX) won six matches between singles and doubles, and senior Jeremy Sawyer (Reno, NV) played #1 singles and #1 doubles for the Steels all season. For Juarez and Sawyer, 2017 was their second year as All-HVIAC players. Also, during the course of the season, Bouquet was named Player of the Week, and freshmen Nicolass Schutterop (Pittsford, NY) and Ola Boulos (Lutz, FL) were honored as Rookies of the Week. The CIA competes at the intercollegiate level in soccer, cross country, volleyball, basketball, and tennis.